French President Emmanuel Macron has warned against showing any weakness towards Vladimir Putin while insisting he wants to work with the Russian President. "He's strong and smart. But don't be naive. He's obsessed by interference in our democracies," Mr Macron told Fox News Sunday. The remarks came as Ms Macron prepares for a three-day state visit to the United States, where Russia stands accused of meddling in the 2016 presidential election. "I do believe that we should never be weak with President Putin. When you are weak, he uses it," Mr Macron said. "And it's fine. That's a game, that he made a lot of fake news. He has a very strong propaganda, and he intervenes everywhere ... to fragilise our democracies. Because he thinks it's good for his country. "I think he's a very strong man, he's a strong president. He wants a great Russia. "He is extremely tough with minorities and his opponents, with an idea of democracy which is not mine." "I respect him. I know him. I'm lucid. 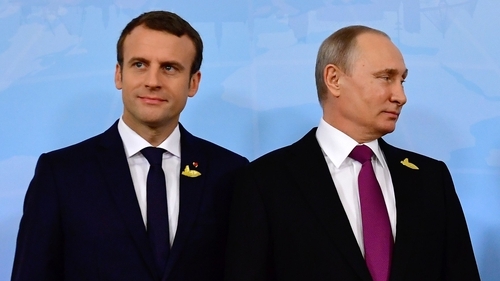 I want to work with him, knowing everything about that," said Mr Macron, who described himself as having a "permanent discussion" with Mr Putin, although they were "disaligned on a lot of things". Relations with Russia will be one of the issues topping the agenda this week as Mr Macron is hosted by President Donald Trump. Mr Trump's time in office has been clouded by suspicion that his campaign conspired with Russia to tilt the election in his favour, and by his own ambivalent attitude to Russia.